Featuring the Royal Crest in Sapphire Titanium! Queen Elizabeth II is unique as she is the very first British Emperor to have a reign long enough to attain a Sapphire Jubilee. 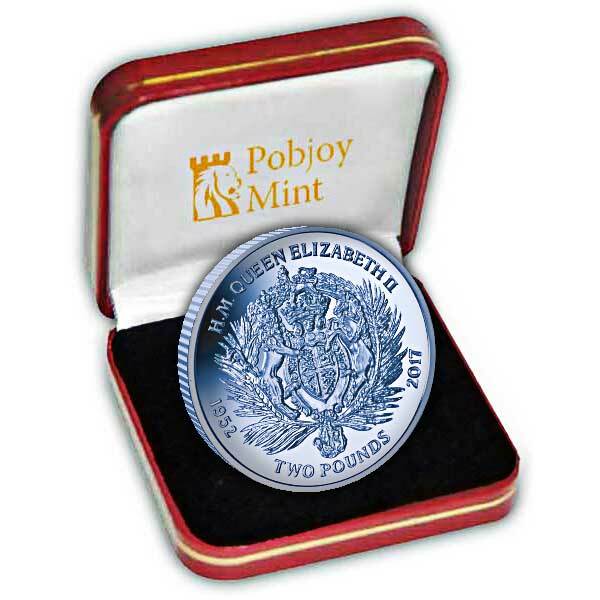 Pobjoy Mint will honour Her Majesty by releasing a coin featuring the Royal Crest. The 65th anniversary is connected with the gems sapphire - symbolic of commitment and some state can bring inner peace and fulfilment of dreams and prosperity. The colour connected with this anniversary is blue - symbolic of trust and peace, loyalty and stability, all characteristics you would expect in a Sovereign. The Royal Crest featured on the design has evolved over 9 centuries since Richard the Lionheart picked three lions to represent England. The Crest appears on the gates of Buckingham Palaces and shows the shiel of the UK Royal Arms supported by the English Lion left wing and the Scottish Unicorn on the right. The patron saint of England, St George is shown just below the crest. 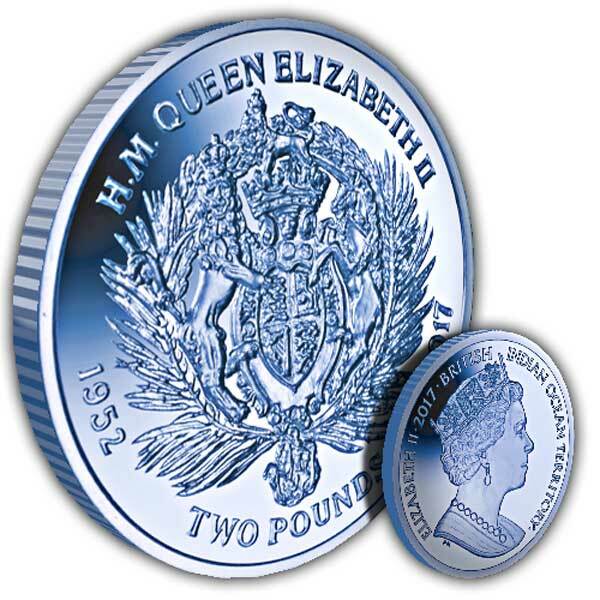 The obverse includes the Pobjoy unique effigy design of HM Queen Elizabeth II in remarkable detail. As Titanium responds differently with every strike each of the 7,500 Titanium coins are technically different and vary somewhat in colour. There is likewise a lined impact that is present on the coins which is unique to this metal.